Look up, and swear by the green of the spring that you'll never forget." 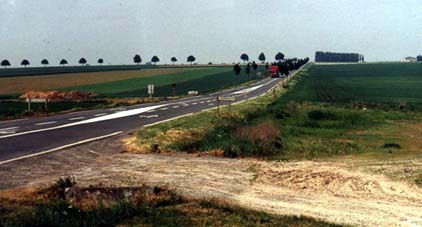 The road leading from Arras to Guemappe leaves the town as straight as an arrow. It is a military road, originally built by the Romans, just one of the many Armies who have ranged over this part of Northern France during the centuries. Travelling the road today it passes through pleasant rolling countryside, not dissimilar to the English South Downs. Small farms and buildings dot the edge of the highway, with villages and woodland off in the distance. Guemappe is a typical small village of this part of the country. The houses are neat and clean standing just off the streets and the roadway winds through in a gentle meander. There is a small church and two cemeteries. One cemetery contains the remains of local people and the other those of men from further afield, mostly young, who died before their time. Follow the street as it loops through the village and move back up to the main road. It's quite steep, turning slightly to follow the contours of the ridge as it rises. There's a copse to the right and another dip in front of that, just a small fold in the land. When the road is reached, turn right again, away from Arras, which lies about six miles away. In about three hundred yards the fields on the right hand side flatten out a little. This is the site of Cavalry Farm. There is nothing to see now. There is a new farmhouse on the opposite side of the road. The old buildings lie mostly buried beneath the soil. I visited on a beautiful spring day in May 1998. When my grandfather, Archibald Roy Watts, was here a little over 81 years before things were very different. On a cold night in April 1917 he was to win the Military Cross. Archibald Watts, or " Watty " as he was known, was born in Frimley, Surrey, in July 1891. He was the son of an old soldier who was coming to the end of 30 years service with the Cameronians and latterly as Quarter Master Sergeant at the Royal Military College (as it then was) at Sandhurst. His two elder brothers had enlisted in the Queen's Own Cameron Highlanders. He followed in their footsteps, continuing a family Regimental tradition which was to last for over fifty years. 7535 Boy Watts enlisted on January 19th 1906. He was discharged on the 10th August 1909 not having reached the required physical standard. However, in true Cameron tradition and not being daunted by this early setback to his military career, he re-enlisted as 9128 Private Watts on 1st September 1911. He sailed for India with the Battalion on 11th January 1913, returning to Europe at the outbreak of war in 1914. In 1915 he fought and was wounded at the battle of Loos, a time of heavy losses for the Camerons. In late 1916 he was commissioned into the 6th Battalion. April 1917 saw him at Arras.This was at the time of the Great Spring Offensive. The Germans had withdrawn to the Hindenburg Line and the plan was to cut off the Salient by massive offensive. The Royal Flying Corps were to clear the skies of enemy aircraft. Instead it lost 1/3rd of its operational strength in France. This was "Bloody April". The fight on the ground met with early success, but at a high cost of human life. The advance was far from uniform. Begun on April 9th,because of mounting casualties the offensive was called off on 15th April. 4 miles or thereabouts had been taken. The memorial in Arras bears the names of almost 36,000 British soldiers who died in the fighting but have no known grave. Other graveyards in and around the town add significantly to that number. 1916 - aged 25 The weather had been awful, freezing cold and frequent blizzards. There was not much quick improvement. The 6th Battalion were billeted in Arras. For a while there seemed to be a chance of improvement but this was short lived. The offensive was re opened on 23rd April to remove pressure from the French, after the calling off of the offensive at the Battle of the Aisne. Even before then the lull in the fighting had been comparative. 6th Camerons had been in the front line between 19th and 21st April and throughout that time had been under heavy artillery fire from German 5.9's. On being relieved by 13th Royal Scots the first 3000 yards of the march back to Arras was carried out under an intense gas barrage. At 1.30 AM on 23rd April the Battalion moved into reserve in readiness for the attack. Two companies moved to the forward line but had to be brought back because of overcrowding. As they withdrew they came under heavy enemy shellfire. The main attack was due to be launched at noon. That attack was cancelled because of a German counter attack at Guemappe. From 7AM to 1PM "A" Company was engaged in carrying parties whist under heavy shell fire. On the following day the Battalion were ordered to remain in position to form the reserve of the next attack which was to be conducted by 46th Brigade through 44th and 45th Infantry Brigade the latter of which 6th Battalion were part. Remaining in their trenches they were subject to heavy artillery fire throughout the day. Having done so, at dusk two Companies were ordered to carry rations for 46th Brigade from a rear to a forward dump. They completed their task at 4AM the next day. The other two companies stood to in their trenches all night. In other words the men had been under heavy shellfire for two days and had had no rest for nearly 24 hours. On the 25th April the Battalion established their position on the front line, 45th Infantry Brigade on the left of the Divisional front with the 6th Camerons on the right of that front. They were in Guemappe. A line of communication had to be opened. This was achieved by a cable 2500 yards long. The cable needed frequent repair. The Battalion signallers who undertook this task came under fire from artillery, machine gun and snipers. In addition "A" and "B" companies established strong points in front of the front line on the ridge rising the other side of the village. This was done at night. Unfortunately the siting of these strong points was imperfect and they did not offer a clear view of the enemy line as they had been placed short of the crest of the ridge. Cavalry Farm lay just beyond that ridge. Reports seemed to have indicated that the trenches running due north from the farm were not particularly heavily manned and merely represented a fairly isolated pocket. A raid was planned. It was to be on two fronts, 6th Camerons from the west and 44th Brigade from the south. The raid was to be carried out at night. At 10.30PM a three minute barrage was laid down and then "A" and "B" Companies advanced towards the crest of the ridge and on to the farm. The reports had been wrong. The enemy were in much greater strength than had been expected. The two companies were now trapped in enfiladed fire from three sides, poured on them by rifle and machine guns. Drawn into this vortex they managed to get within 20 yards of the German trenches but suffering extremely heavy causalities. They had no option but to lay down and take stock. Perhaps one option would have been to withdraw. It does not seem that this was considered. Instead working parties were organised and by dawn six strong points were established and manned, all undertaken under heavy fire. Matters did not improve with the new day. 44th Brigade's attack had been driven back leaving the Camerons isolated and within point blank range of the enemy. As dawn broke the four right hand strong points came under rifle and machine gun fire from three sides at once, in readiness for an enemy counter attack. The post garrisons returned fire but the attack upon them was so intense that it was impossible to raise their heads above the parapet. All the No. 1's of the Lewis Gun teams were shot through the head. The attackers came out from the farm and the trenches to north of it. A bloody hand to hand fight followed with the Germans using stick and smoke grenades. Only Second Lieutenant McGruer, with the aid of the accurate use of his revolver, and three wounded men managed to fight their way out alive. The two strong points established by "B" Company( to which my Grandfather belonged) withstood the attack throughout the day. Assisted by a barrage laid down by 18 pounders they were able to keep up rifle and Lewis Gun fire on the farm and the German trenches. In his report to 45 Infantry Brigade the Battalion commanding officer Lieutenant Colonel J.C. Russell says " Second Lieutenant Watts was instrumental in reorganising his front line and bringing heavy fire to bear on the enemy. He himself showed a splendid example to his men by constantly standing on the parapet in the open with a rifle, sniping all Germans who showed themselves. One sniper alone of the Company accounted for 12 of the enemy." The line was held with enforcements from "C" Company , and when relieved by 13th Royal Scots withdrew to the old front line trench. (1) The true position and disposition of the enemy were not known. It since transpires that the advance was made into a regular pocket which under no conditions could have been held. (2) The enemy was in far greater numbers than was expected. It is the opinion of the Officers on the spot that from the numbers of the enemy seen a counter-attack in considerable force had been contemplated. (3) The failure of the Brigade on our right to hold its objectives thereby exposing our right flank, our right post being only some 30 yards from Cavalry Farm." At 8.30 PM on the 28th April the Battalion was relieved by the 1st London Regiment and marched back to Arras. The casualty figures for these few days were Officers 6 and Other Ranks 126.
" For conspicuous gallantry and devotion to duty. When the enemy raided one of our strong points, he moved about the men encouraging and directing them. He went out in front with a rifle himself and accounted for several of the enemy. Place and date of deed- N.E. of Guemappe 26th/27th April 1917." His was not the only deed of gallantry over those two days. Second Lieutenants Alexander and McGruer were also decorated. In fact in my opinion every man who fought in this bloody, nasty little affair showed a form of courage which many would find difficult to discover in themselves. My grandfather would probably tell me that there was nothing special in this. They were Camerons and that's what Camerons do. This engagement was a very minor event taken as a part of the overall action on the Western Front between 1914 and 1918. It does not feature in any of the major authoritative works of history. It is mentioned in the Regimental history and not much else, but it is not untypical of many such actions and deeds of gallantry that were fought out by the men who took part in the Great War. When I think of my grandfather I remember him as an old man, or certainly, from my perspective as a boy, he seemed so to me. It was many years before I saw a photograph of him in uniform, standing in a field somewhere in France. The ribbon of the Military Cross is sewn to his tunic. He stands easily, eyes slightly closed against the sun behind the photographer. There is look of confidence and determination on his face. He is 26 years old. He looks like a man in his forties. My view of him changed when I saw this picture. I wanted to find out more about him, but of course, as is often the case he wasn't around to ask. Only now am I beginning to put together a few scant pieces of information. I still have a long way to go. But having read the report of the action in this tiny corner of France and looked up the ridge from Guemappe towards Cavalry Farm I feel that he has begun to tell me his story. It is one that makes me proud to be the grandson as well as the son of a Cameron. The War Diary of The 6th (Service) Battalion of The Queen's Own Cameron Highlanders is contained in document number WO95/1945 at the Public Record Office, Kew. Crown copyright material in the Public Record Office is reproduced by permission of the Controller of Her Majesty's Stationery Office. John Watts : Worcester : England : June 13th 1998.